A drink bottle with a unique style and twist. Available in a lot of colours and can be printed in full colour! 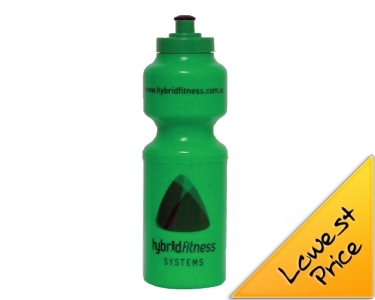 Custom Promotional Drinks Bottles for clubs, companies and government - for anyone! The humble drink bottle has been around for about as long as water and mankind. For millenia we have cherished water as our favourite (ok, after beer and wine) and most abundant drink. The Romans created earthenware drinking vessels, the ancient hunter gatherers stored water in animal hides - transporting water to the point and time of consumption is not a new challenge for man!& nbsp; Thankfully times have changed and in this day and age the drinking tap takes care of quenching our thirst most of the time. However when we are out and about - in the car, at your work desk, bush walking, at the beach, collecting the kids from school or playing sport there is still a demand for water. Enter the Promotional Water Bottle. Made, usually, from either plastic or metal you will see a vast array of bottle styles whilst browsing through brandme.com.au This array of bottles gives you many options when making your selection. You may be driven by cost or the desire for something unique and special - we have the range here and when different colour options are also taken into consideration the options presented to you are considerable. Of course what we specialise in is branding these sports drink bottles with your logo or message - it is what we do day-in, day-out. We have a dedicated team here who can first of all help with selecting the bottle that suits your budget, brand and marketing goals. Then our graphic designers step up to the plate to transform what is a generic product in a unique marketing item. The amount of customisation that can be provided on a Promotional Drinks Bottle largely depends on the print process we can use to decorate it. As a general ruler the lower cost plastic bottles can be printed almost all over when we use a rotary screen print machine. Plastic allows print to adhere easily also which also allows us to push out the print area a little more. In contrast Metal Drinks Bottles, usually, cannot be printed in the same way, locally here in Australia at least (we can usually arrange this print method at overseas factories - minimum spend for this type of work is usually around $5K). Metal does not soak in print inks as easily as plastic and therefore if we try to print all over these bottles using a rotary print the results can be somewhat mixed. We usually decorate metal bottles by using our pad print system or by laser engraving and you will find most metal bottles have both decoration options. As a small side note please be aware that all Custom Water Bottles that you see here are BPA free.